View the video by subscribing to the Telegraph-Journal online. Subscribe to the e-edition and gain access to all past and current publications. photo-op. And he should know. 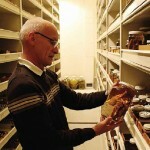 Pohle has been counting crustaceans and curating the invertebrates collection at the Atlantic Reference Centre in Saint Andrews since 1984. The centre is a research museum that houses specimens of marine life found everywhere from the Arctic to the Gulf of Maine. 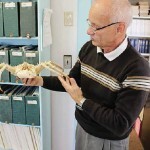 The reference centre is a partnership between the not-for-profit Huntsman Marine Science Centre and the federal Fisheries and Oceans department, and Pohle has been there since its inception. There is indeed a large library of jars full of preserved fish and crabs of all sorts, but Pohle also works on applied projects that use the tools of biodiversity research to answer bigger questions. The centre’s core task of taxonomy has expanded, and the centre now has partnerships with industry and public bodies alike. “The spectrum can be anything from somebody coming from the public and saying ‘I found this on the beach, what is it?’ – we do that – to more elaborate things like this where we have a rigorous sampling program and we identify everything that is brought to us.” One of the “more elaborate things” Pohle refers to is a set of long-term studies into the effects of aquaculture. Aquaculture itself has changed over the past 20 years, and a new iteration of the same study can help quantify how those changes affect sea life. The final year of data collection has just been completed. Pohle has also worked on projects to get an inventory of marine life in the arctic and see how it’s shifted in recent years – data that’s vital to understanding the effects of climate change. And he’s been part of assessments of planned marine protected areas in the Atlantic region. The variety of the job is a selling point for Pohle, whose academic background was very specific. “I did my PhD work at the University of Toronto on parasitic crabs, which is a rather esoteric subject. It was during his time in Toronto, where he completed both a B.Sc. and a PhD, that Pohle encountered the Huntsman. Having reliable data on the biodiversity in our oceans can provide an early warning to the effects of climate change or risks to species before they’re on the brink, Pohle says. 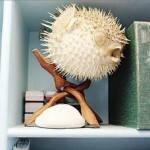 Has there been a shift in the numbers of suspension feeders versus bottom feeders, for example? The small shifts in community structure are harder to read, but essential to understanding environmental changes as they’re occurring, rather than after the fact. Even in taxonomy, nothing stays the same. Pohle likes it that way. Martin Wightman wightman.martin@brunswicknews.com Science and research columnist, and copy editor at Brunswick News. In the Lab appears every other week in Innovate.